Botany: Brāhmī is a prostate or creeping succulent annual herb, rooting at the nodes with numerous ascending branches. The leaves are oppositely arranged, margin simple, obovate-oblong, and sessile, with small black dots. The flowers are solitary, pale blue or white, borne in the leaf axils on long slender pedicles, giving rise to two-celled, two-valved ovoid capsules that contain numerous tiny seeds. Brāhmī is found throughout tropical India in damp, marshy areas (Kirtikar & Basu 1935, Warrier et al 1994). 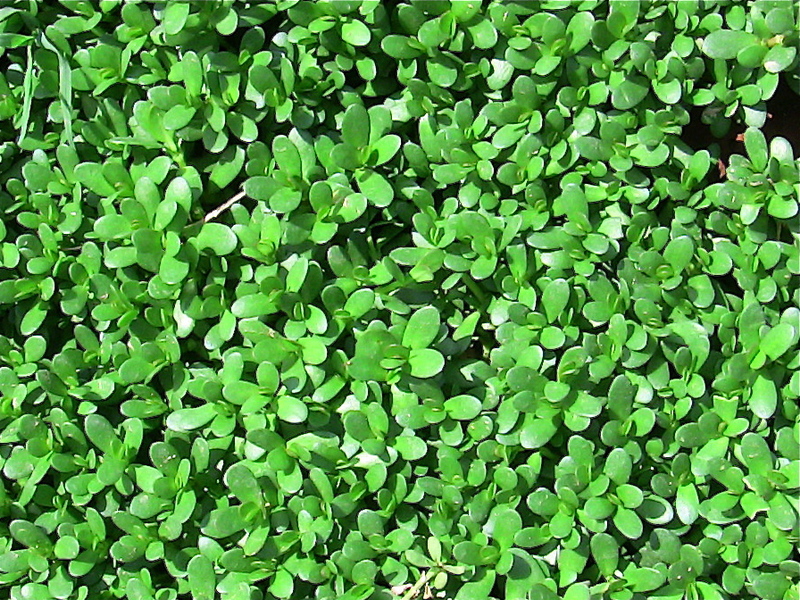 Brāhmī is soometimes found as an ornamental ground cover, and is under cultivation in India and other warm, wet locations. • Prabhāva: The name Brāhmī means ‘consort of Brahmā’, the active, feminine counterpart (śakti) to Brahmā, the lord of Creation in Hindu cosmology, suggesting that this herb has a direct ability to faciliate divine consciousness (Dash 1991, Srikanthamurthy 2001, Warrier et al 1994). Constituents: Researchers have isolated numerous glycosidal constituents from Brāhmī, including the saponins monnierin and hersaponin, dammarane-type triterpenoid bacosaponins that include bacopasides III, IV, V, bacosides A and B (which upon acid hydrolysis yield the aglycones bacogenins A1-A5) and bacosaponins A, B and C. Other saponin glycosides include the jujubogenin bisdesmosides bacopasaponins D, E and F. Other constituents include a matsutaka alcohol derivative, a phenylethanoid glycoside, luteolin and luteolin-7-glucoside, the alkaloids brahmine, herpestine and a mixture of three bases, D-mannitol, betulic acid, ß-sitosterol, stigmasterol and its esters, heptacosane, octacosane, nonacosane, triacontane, hentriacontane, dotriacontane, nicotine, and 3-formyl-4-hydroxy-2H-pyran. The presence of a-alamine, aspartic acid, glutamic acid and serine has also been reported (Cakravarty et al 2003, Garai et al 1996a, Garai et al 1996b Hou et al 2002, Mahato et al, Rastogi et al 1994, 2000 Yoganarasimhan 2000). • Human trials: In a trial of 81 volunteers Bacopa significantly improved verbal learning, memory acquisition, and delayed recall (Morgan and Stevens 2010). In a study of 48 healthy participants, aged 65 or older without clinical signs of dementia, were recruited and randomized to receive Bacopa or placebo. Participants that took Bacopa participants had enhanced word recall memory scores relative to placebo, also decreasing depression and anxiety scores, as well as heart rate (Calabrese 2008). Brāhmī demonstrated a significant effect upon the retention of new information, decreasing the rate at which newly acquired information is forgotten, in adults aged between 40 and 65 years (Roodenrys et al 2002); Brāhmī significantly improved the speed of visual information processing, learning rate and memory consolidation, and reduced anxiety, in healthy human subjects (Stough et al 2001). Indications: Mental fatigue, poor memory, depression, psychosis, dementia, epilepsy, neuralgia, weakness, fatigue, debility, aging, infertility, fever, skin diseases, atherosclerosis, angina, hoarseness, bronchitis, asthma, dyspepsia, flatulence, constipation, splenomegaly, ascites, urinary tenesmus, musculoskeletal inflammation, anemia, poisoning. Contraindications: pittakopa in high doses; use with extreme caution with antiseizure, antipsychotic, and antidepressant medication. Medicinal uses: Brāhmī is among the more important botanicals used in the treatment of unmāda (‘psychosis’) and apasmāra (‘epilepsy’), often taken by itself in the form of the fresh juice, mixed with honey, or in complex polyherbal formulations. One remedy mentioned by the Cakradatta is Brāhmīghṛta, prepared by cooking one part aged ghṛta in four parts fresh juice of Brāhmī, mixed with the powders of Vacā, Kuṣṭha and Śaṅkhapuṣpī (Sharma 2002). This recipe or similar is mentioned also in the Bhāvaprakāśa and the Aṣṭāñga Hṛdaya, used in the treatment of unmāda, apasmāra and spiritual possession, taken in doses of 12 grams, with warm water or milk (Srikanthamurthy 2000, Srikanthamurthy 1995). The Śāraṅgadhara saṃhitā recommends a similar preparation in the treatment of unmāda, comprised of the fresh juices of equal parts Brāhmī, Kūṣmāṇḍa, and Śaṅkhapuṣpī mixed with Kuṣṭha cūrṇa and honey (Srikanthamurthy 1984). A simpler preparation is made by decocting one part of the dried herb or fresh juice in four parts ghṛta and sixteen water until all the water is evaporated. The resultant preparation is filtered and then applied as a nasya in doses of five drops per nostril in the treatment mental disorders. A similar preparation but using sesame or coconut oil results in a preparation that can be massaged into the feet, large joints and ears before sleep in the treatment of anxiety and depression. The Bhaiṣajyaratnāvalī mentions a complex formulation called Sārasvatariṣṭa, a fermented beverage in which Brāhmī is the major constituent, used in the treatment of infertility, epilepsy and mental disorders, dosed between 12-24 mL twice daily. According to the Bhāvaprakāśa, a lehya prepared from equal parts Brāhmī, Vacā, Harītakī, Vāsaka and Pippalī mixed with honey is an effective treatment for hoarseness, enabling the patient to “be able to sing along with the divine nymphs within seven days” (Srikanthamurthy 2000). Combined with equal parts Aśvagandhā and Kapikacchū, Brāhmī may be helpful in the treatment of Parkison’s disease and epilepsy. In the treatment of Alzhemier’s disease, Brāhmī may be helpful when combined with botanicals such as Ginkgo (Ginkgo biloba), Hawthorn (Crataegus oxycanthoides), Rosemary (Rosmarinus officinalis) and Haridrā. In childhood ADD/ADHD, autism, and PDD Brāhmī may be of great help, used along with herbs such as Ling zhi (Ganoderma lucidum), Milky Oat seed (Avena sativa), Skullcap (Scutellaria lateriflora) and Aśvagandhā. In unipolar depressive states and chronic fatigue Brāhmī may be helpful when used along with equal parts St. John’s Wort (Hypericum perforatum), Damiana (Turnera diffusa), Vervain (Verbena hastata) and American Ginseng (Panax quinquefolium). In the treatment of addiction and withdrawal, Brāhmī may be helpful when taken with equal parts California Poppy (Eschscholzia californica), Milky Oat seed (Avena sativa, Aśvagandhā and Skullcap (Scutellaria lateriflora), used in high doses as a weaning agent, or to reduce usage. In the treatment of hypothyroid conditions Brāhmī may be helpful when combined with equal parts each of Guggulu and Kelp (Fucus vesiculosis), with one half part each Iris root (Iris versicolor) and Oregon Grape root (Mahonia aquifolium). As a nootropic agent Brāhmī can be taken by itself or with other similar herbs such as Maṇḍūkaparṇī, as the svarasa (fresh juice) or hima (infusion) to improve memory and retention by students, but only when taken regularly throughout a semester, not the evening before an exam. • Cūrṇa: 3-10 g, b.i.d.-t.i.d. • Svarasa: 10-25 mL, b.i.d.-t.i.d. • Hima: 1:4, 30-120 mL b.i.d.-t.i.d. • Taila: 1:4, ghṛta, 12 g b.i.d.-t.i.d. ; as abhyaṅga ad lib. ; as nasya 5 gtt. in each nostril sd. • Tincture: 1:2, fresh plant; 1:4 recently dried herb, 1-10 mL b.i.d.-t.i.d.